Year in, year out - carpet remains the most popular choice in flooring for homes throughout the Indianapolis area. It's not hard to see why. Carpet instantly adds warmth to a room and comes in many colors and styles. It is soft underfoot and can help quiet a room. You can install carpert almost anywhere, even outdoors. And it's easy to care for. Bottom line: carpet is an excellent value for your dollar. When you're considering carpet for your Central Indiana home, you'll likely have some questions about how it fits in your lifestyle. The experts at Kermans have the answers. What kind of padding do I need for my carpet? The Carpet and Rug Institute recommends different pads for different carpet types. For example, cut pile carpet should have a cushion that is no thicker than 7/16 of an inch and a firm cushion. Berber carpet and most commercial carpet should have a cushion no thicker than 3/8 of an inch and be a very firm cushion. When you stop by Kermans, you can touch and feel padding options to help make the right choice. I have dust allergies but I really want carpet. Is there a carpet that's right for me? With proper care, a carpet can actually be of help to people with dust allergies because it traps the dust where a hard floor has dust on top that is constantly kicked back into your breathing air. We recommend that people with allergies vacuum their carpet at least twice a week and have their carpet cleaned the way the manufacturer specifies approximately every 12 to 18 months. I'm concerned about carpet showing wear patterns, is there a carpet that can stand up to high traffic? When carpeting a high traffic area, you want to look for carpet with a dense construction (meaning you don’t want to be able to easily see, or feel the backing of the carpet through the fiber). Shorter pile heights perform better in heavy traffic areas (like entry ways, stairs, halls, playrooms) so choosing a pile height with a ½ of an inch or less will be more durable. If choosing a cut pile carpet, a tighter twist will be more durable than a looser twist. If choosing a Berber carpet, the smaller tighter loops will be more durable than the larger looser loop. This can be a tricky choice, but the experts at Kermans are happy to show you different samples and talk through the benefits of each. How often should I vacuum or clean my carpet? When you take care of your carpet, it doesn't just look and feel better - it lasts longer. Each carpet comes with manufacturer's guidelines and we recommend you follow those. Review our carpet cleaning tips for more details. Why should I buy my carpet from Kermans? 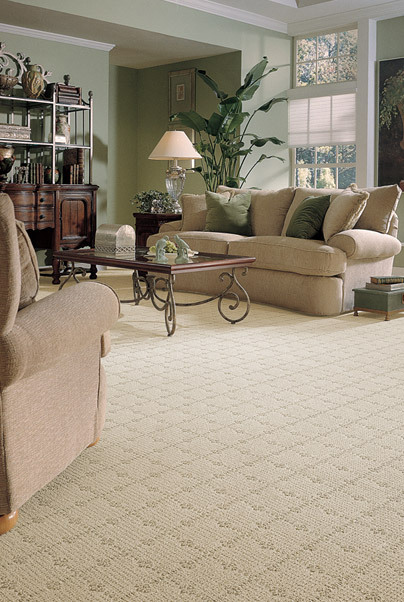 Constructed from renewable resources, this carpet is good for the environment and your budget. Includes a Lifetime Stain Warranty. Special offer: $1.99 per square foot, material only. We welcome your questions and look forward to helping you find just the right flooring - whether it's hardwood, carpeting, tile, area rugs or some combination of them all. Check out our Carpet Buyer's Guide to learn more about your carpet options. Then visit our Indianapolis showroom to experience the Kermans Advantage for yourself.